President Merele Overton with Librarian Brenda Barrett., Patron and Mayor Dr Michelle Byrne and Michelle de Mari and Sue Tolhurst. Who knew that giving up just one coffee a month would leave a lasting legacy at Castle Hill Library. It took two years but members from The Friends of the Hills Library gave up one coffee per month and raised a staggering $4000 to purchase a collection of over 100 items to support people with dementia, their family, friends and carers. Club president Merle Overton said she was absolutely delighted with the result which coincides with the group’s 25th anniversary. A large gathering was on hand last month to witness their club President and Hills Mayor Michelle Byrne cut the red ribbon to officially launch the collection of books, music, DVDs, and resource material to help patients, family and carers and friends dealing with dementia. Ms Overton said the coffee sacrifice would continue to add to the add to the library resources. She said that by 2020 it was expected that 590,000 people would be suffering dementia in Australia. It is the second leading cause of death. Sue Tolhurst from the West Sydney Area Health Dementia advisory service said she hoped other libraries would take note. She said social connection was really important and may play a big part in delaying dementia. 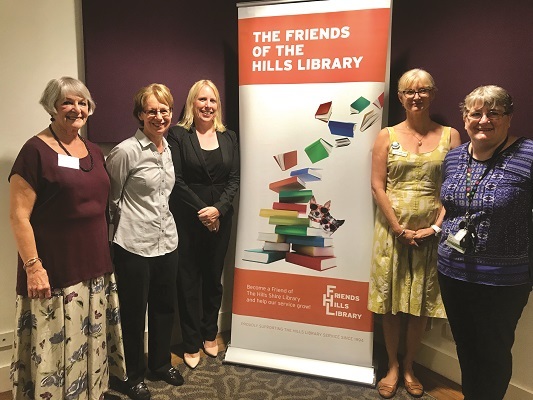 Patron of The Friends of The Hills Library, Mayor Michelle Byrne thanked the members for their “outstanding work” in making the dementia collection available to residents and library members. “A diagnosis of dementia is lifechanging for the person suffering from the disease, as well as with their family and friends,” she said.